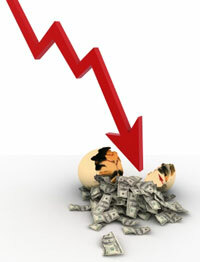 With My System You Can Make Money from the Stock Market DURING the Recession... No Matter How Bad the Economy Gets! and how you'll be able to access it. The reason why I decided to teach you my methods is revealed in this letter. I'm not going to hide anything. Unlike many people who teach options and stocks, I am NOT a former market maker or specialist or a licensed professional in the financial industry. I am a retail investor just like you. The difference is that I found a way to be successful and profitable trading stocks and options as a REAL business from my home office. So you're probably asking yourself, "Why would he give away these secrets?" 1) There's no reason not to teach you my secrets. Seriously. I have nothing to lose. The markets are huge and worldwide and anyone can trade them without decreasing the opportunity. In fact it would only make things better. The more traders, the more money we can make and the more liquid the market becomes. Unlike other businesses - such as the one I have been involved in for the last 9 years (Internet marketing)- this business only gets BETTER as more people do it. 2) I am a business person but I am also a teacher. I have been teaching people how to use the Internet to start a business since 1999. I have taught thousands of people how to make their living online so teaching is something I love to do. There are not many people who really understand this business and are willing to teach it to others. 3) Frankly, a little extra money from selling this course means more I can put to good use in my trading business. Obviously I put my money where I get the largest return for the amount invested. Most of the money I make from selling this course goes directly into my trading business. I don't know what your abilities are or how fast you can learn this business as I teach it, so I will never tell you how much you could make but 5% (or much more) per month is a very reachable goal. I've personally seen returns as high as 62.5% (ROM) - that's $1,000 for every $1,600 invested. Once you know the system, this business can be managed in 15 minutes a day. There are a total of 41 videos within the course. The videos are grouped into several "Modules", with each Module containing 'hands-on' videos walking you through the topics covered. You can watch these videos directly on your computer... we will give you a username and password to access them anytime of the day or night - whenever it's convenient for your schedule. In addition, you will have permanent access to these videos and you will also receive any new ones we add at a later date! I'll also give you a historical perspective on market movements going back to 1900 and give you a realistic plan of attack for determining future market direction based on factual evidence. In the 2nd video, I dive into short-term indicators that can sharpen your edge in the markets to better time your trades. Then I tell you about an indicator I stumbled on, that predicts short-term and opening market direction with an amazing degree of accuracy close to 95% of the time as well as how to determine intra-day movements and how to tell whether money is flowing into or out of stocks and what it means for intra-day price trends. This module contains well over 3 hours of solid teaching. Due to ever-changing and somewhat confusing rules and scrutiny by federal regulators of online income claims, I've decided not to tell you on this page how much money I've made with this method. I will just say it's a VERY exposive strategy, designed to maximize profits and minimize risk. Amazing potential profit/loss ratio. And it doesn't matter if the stock goes up or down but does require an longer time frame- 6 to 8 months. Another method I call "Flipping Stocks" let's me buy stocks cheaper than anyone else and if the market does not cooperate with my plan - I get paid lots of money for waiting until it does! This is for bigger players with more capital... but when you have $15k or more to put to work, these longer term trades generate explosive profits. I teach it to you in a nice 52 minute video. This new strategy that has unlimited upside or downside potential and only $50 or so of risk! This strategy is extremely powerful and one of the biggest real 'secrets' that no one has ever discussed that I know of. Wait till you see the power of this strategy. (Again, I've intentionally omitted my income numbers from this page.) Think there's no free-lunch on Wall Street? This isn't one either but it's as close as it gets to one! This is the perfect strategy for playing earnings reports, takeover news stocks and any stock you think will move big in any direction with little risk. This strategy includes 9 videos, and I take you through some real life trades over the course of 7 days and show you exactly how I make thousands of dollars with these trades. If you liked the idea of the monthly income trades but were wondering how to 'turbo charge' them to make a fortune, then you will love THIS. When I first started using this strategy I saw a huge difference. I started generating a lot more income, and was doing it with a lot less stress! This last strategy is the 'icing' on the cake... the peak moment in all your hard study and could be worth 100 times what you paid for this course - maybe even more. Why didn't I reveal this until the very end of the course? Simple: You would not be able to use this strategy without a good foundation that was laid out in the earlier Modules. Everything we have learned thus far has been leading up to these explosive strategies. The videos and modules are very well organized in an easy-to-navigate membership area, and they are sequenced in a perfectly logical order so that you can learn the system one step at a time. The course will be delivered to you 100% online. 1) Online Streaming. You can stream the videos directly in your browser (Flash videos, which are compatible with virtually all browsers), so you don't have to download anything if you don't want to. $147.00 Value - Yours free when you join today! $97.00 Value - Yours free when you join today! As you may have noticed, while I do cover some day trading in the main course, it is is NOT a "day trading course". However, I am able to apply my principles to a certain type of day trading, and I use this powerful strategy to grab profits on demand. This 50 minute video will show you exactly how I do it. $197.00 Value - Yours free when you join today! Each of these reviews is a downloadable video, so you'll be getting many extra hours of my top notch content. As if you're not already getting enough! (this is in addition to the 24 hours of videos you're already getting...). $150.00 Value - Yours free when you join today! Each month I will email you a special trader alert with information about a trade I'm making, or other "inside info" to help you profit from the CURRENT market conditions, whatever they may be. Okay, so now I've just added $591.00 worth of bonuses onto the course. Therefore, I'm setting a strict limit, and if we don't completely sell out, the price will continue to go up! That's not a misprint. I'm going to give you FULL access to this potentially life-changing program for your first payment of only $397 $197 or $37 today. You don't have to get all the material. You will get the entire thing INSTANTLY when you join today. Initially I had considered breaking it into pieces and charging extra for the super-powerful strategies contained toward the end of the course, but I decided that you should have the ENTIRE thing, and I'm going to give it ALL to you in one membership. My course has everything needed to teach you how to make money like a pro with stocks and options. For one thing, I want to make sure I'm able to answer as many of your questions as possible, and that won't be possible if I allow too many people to join. Second, I'm going to make sure that the membership area does not get bogged down by too many members. I insist that the downloads are nice and fast, so I will need to limit the membership. YES, I want the Trading Pro System! Try it risk free today! We believe in this program so much that we're giving you complete access to the entire program and all the bonuses at our risk, not yours! We're willing to do this because we believe it will truly show you how to improve your investment strategy. If you're not satisfied with the program, just let us know within 60 days of your purchase and we'll refund 100% of your purchase. After 60 days, all sales are final. Copyright by Eric Holmlund LLC and InfoProductLab LLC. All rights reserved.